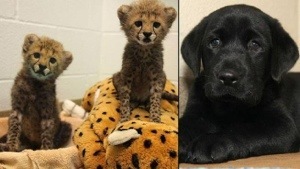 The Dallas zoo has sent in a black lab puppy to calm their two new eight week old cheetahs. The zoo’s creative means of comforting the newcomers got me to thinking about the untapped potential of dog diplomacy. We already know dogs sniff out drugs, improvised explosive devices, and cancer. They find injured and lost people in disasters. They comfort the sick, the dying, and the grieving. They listen to little kids learning to read. They round up criminals, protect property, and their companions. They help the blind see, the deaf hear, and the disabled accomplish many tasks. 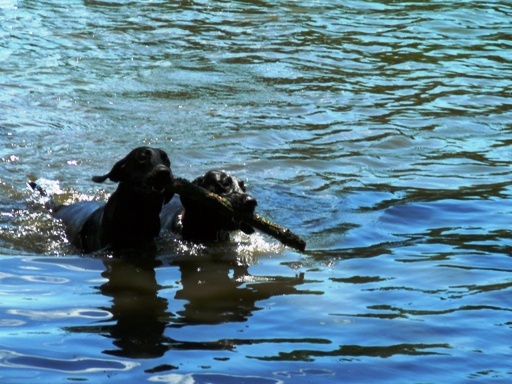 They dive into water and retrieve whatever we tell them to bring back. 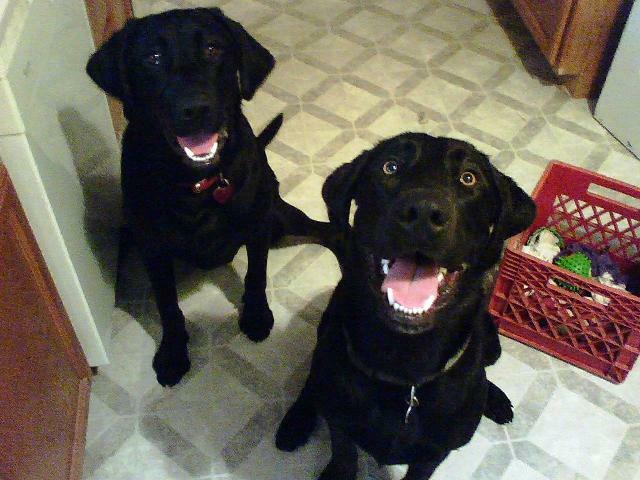 They lower our blood pressure, make us laugh, and love us unconditionally. So here is a proposal for the US response to our intractable problems and never ending crises: form a Labrador Diplomatic Corps. Just imagine what parachuting pups might do for the state of world peace? These guys do eat a lot. So the LDC would need to be followed by a shipload of chow. My plan would still be cheaper and way more fun than any of the other options I’ve seen put on the table. I say put a few pups on that table. Let em run around between the legs of world leaders and chew on their shoes. Let the pups fall asleep in their laps and wake up and kiss their faces. Let the doggies run off with all those piles of papers, attaché cases, and hand held devices. Let them rip and tear all that diplomatic gear and fussy protocol into tiny bits and then pee on them. I think the whole world might breathe a vast sigh of relief. Labrador Diplomatic Corps demonstrating team work. Young member of Lab Diplomatic Corps preparing for training with nervous baby cheetahs. Once he has mastered this diplomatic task, this pup will graduate to lying down with lions. This entry was posted in Animals, Spiritual Practices and tagged animal spirituality, dog, Labrador Retriever, peace making, World peace. Bookmark the permalink. I always look forward to your blog every monday. i love your proposal and i think it is controversial and spot on. the best recommendation i have heard. isaiah even agrees with you. thank you. untrained my dog emma comes and sits on my lap when i am having a seizure aura. Oh I think you are on to something big, Natasha!